We’ve always found it difficult to make Rainbow Bridge announcements, but this one is exceptionally hard. We are heartbroken to report that Jeanne and Steve Lloyd had to put their sweet girl Scout down. Steve and Jeanne had taken Scout and Halima for a pleasant Sunday drive to an apple orchard. They all enjoyed the day. When they got home Scout would not move to jump out of the car. Steve lifted her out and she could not walk. They took her to the emergency vet and the vet told them that she likely had serious disk problems that would result in a bad prognosis for the future. In addition, she had several areas of bruising/blood along her stomach and mid section that might have also indicated another problem. It’s always hard to lose a dog but these are the circumstances that give us pause. Scout was only five years old. 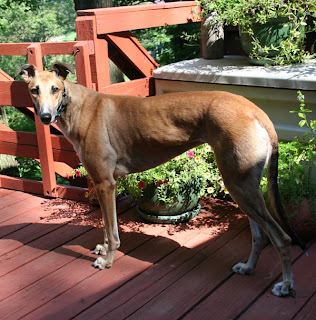 We think the world of Jeanne and Steve; they have been wonderful adopters and active volunteers in our group since they adopted their first greyhound Halima years ago. They truly cherish their dogs. Needless to say, Steve and Jeanne are beyond devastated. We thank them both for giving Scout the chance at a wonderful life, even though it was cut so short. Run free sweet Scout; you are loved and will always be remembered.